So much to say, so little time. I may expand this later. After all our preparations, the time has finally come to race (aside: vignette from oh so many years ago, when I was but a noob at Oxford, so long ago that the word "noob" didn't even exist: another coach, talking to his crew, on their last practice outing: "Pay careful attention to your rowing now, judge yourself, this is how it feels. During bumps, you'll judge yourselves just by how well you do; this is your last chance to know how good you really are"). 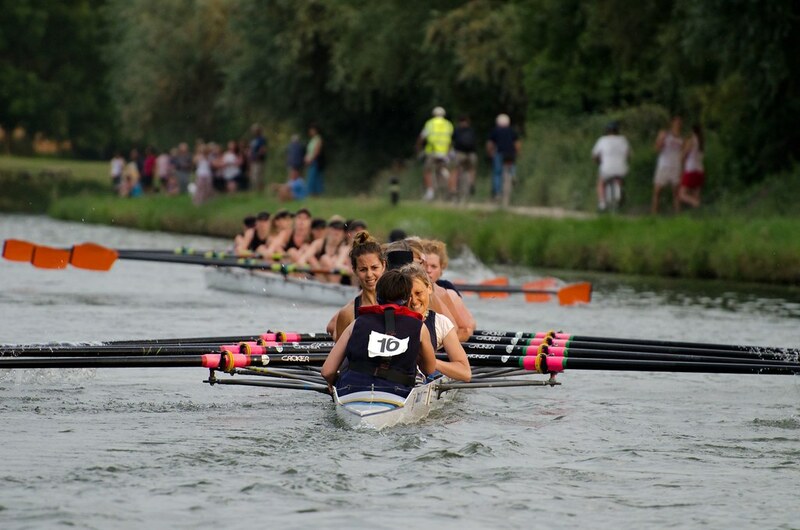 So to spare the drama the result was: W2 up, M2 down, W1 and M1 row-over. But how much wild excitement is compressed into those few words! Aren't we lovely? It felt good too. Other pix from Lorenzo for M1 are here, so you can intercompare. There's video from opposite the railings but that's only boats 1-6. Brief race description: we'd expected the Sharks (City 3, behind us) to be fast but blow up after 500m. We'd expected St Neots to be OK, but not as good as last year. That latter turned out to be true: we got a whistle on them soon after the start. What we'd omitted to think of was how slow Nines 2 were; St Neots got them around the top of First Post Reach. Happily James (helped by John on the bank) saw them well in time to steer round with minimal loss of speed. That left us with plan B: row past FP and wait for the Sharks to blow up. Alas, they failed to comply, and after dropping back to maybe 2 lengths they began to gain ground around Grassy, to perhaps a length down at the top of the Reach. Still, its not far down the Reach (oh yeah) and they'd only closed to within 3-6 feet by the time we were safe and sound. We were all very happy with the row: we felt we'd done well, and "defeated" (if we hadn't been faster than them over the whole course, we'd done well enough to avoid the bump) a powerful opponent (you can read what they say about themselves at http://www.cityrc.co.uk/images/bumps2013/BumpsProgramMenv7.pdf: they're hot). Chasing Champs 3, being chased by Tabs 3. Within a length, I'm told. They say: We were in a Junior Girls sandwich. Champs Girls in front Cantabs Girls behind. Our Time Race result was faster than Champs by 15 secs, but we weren't sure where over the course that would be. Junior girls often have a fast start but not the stamina for the whole course and we'd been told by Cantabs 6 that the G-oar-gous weren't only that but fast too. So for the race, well as always it passed in a blur and we were totally focussed on Ali's voice. The row felt good, with good pushes. Comments from the crew "Chased them all the way, the crew behind gave up trying to catch us at the 2K point. I think my throat and lungs were possibly bleeding after that. Still coughing up shite now!!" Holy Guacamole that was a lung burstingly epic row over! We'll get them tomorrow night though ! And yes a Row Over - but a good one. Down to Nines 4, alas. Still, better luck next time. Probably best seen from Robert's cox-cam - they bumped just after the A14 bridge. They say: Radegund 2 in front and Nines IV chasing. 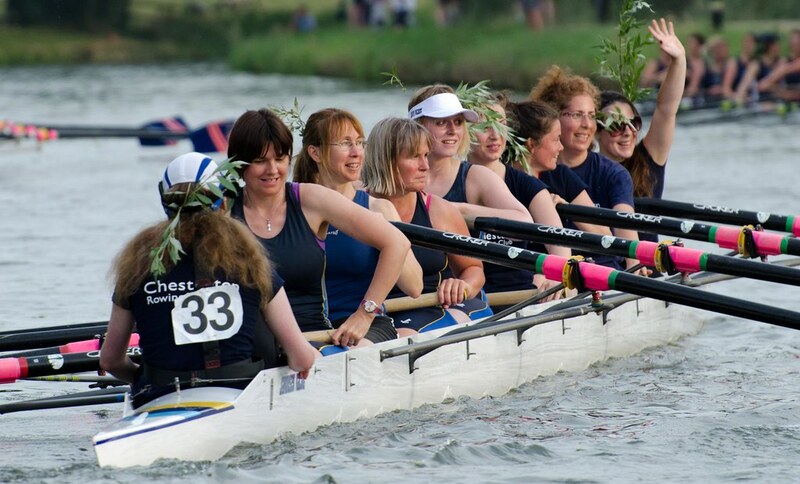 The crews fear that the Nines IV had been training lots and looked tidy proved unfounded; they pulled away quickly and gained on the Radegund 2 crew bumping just after the A14 as can be seen by all the willow.